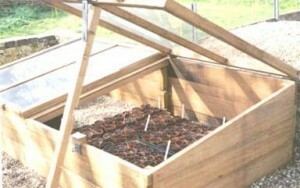 Cold frames are among the simplest and most useful ways to extend the growing season. 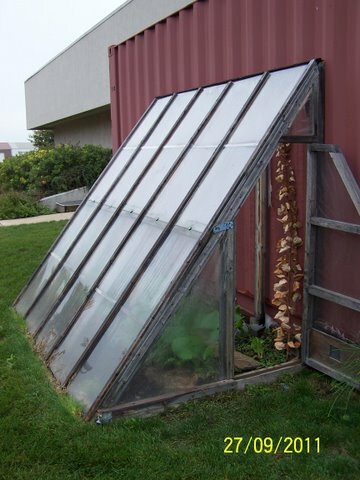 As James Theuri, University of Illinois Extension educator, notes in an earlier post, they are basically a box with a covering to let light and heat in during the fall and winter months. If money is no object is your gardening, there are lots of places to buy kits, but if you would like to save a little money and are willing to do a little scavenging and work, it’s pretty easy to find the materials you need. There’s nothing like an eagle eye during trash day to scrounge up wood and glass. Windows and other sources of glass and lumber are pretty pricey at the hardware store but they seem to routinely find their way to landfills anyway. If you’re looking online, Craigslist, freecycle and a number of other places post free stuff all the time. There are just a couple of things to bear in mind as you’re looking around. The length and width of the box can be adapted to any glass source and garden size, so it might make sense to find your top first and then cut lumber to accommodate the size of the light. (Old windows are a good choice if you can find one for cheap or free, although they are not perfect – the frames can accumulate rain and they really weren’t designed to be sideways.) On the other hand, there is near-universal agreement that you want the box to taper down in size from back to front (and that the box be facing south) to make the most of winter sunlight. Eliot Coleman recommends a 12-inch board for the back of the box and an 8-inch board for the front. There are lots of plans for cold frames online, but they tend to be a bit more complicated than is necessary. (Nevertheless, if you like a blueprint, you can find some here and here.) Lots of people blog about their cold frames and extending the season and it’s definitely worth sticking “cold frame” into a search engine and learning about different people’s experiences. 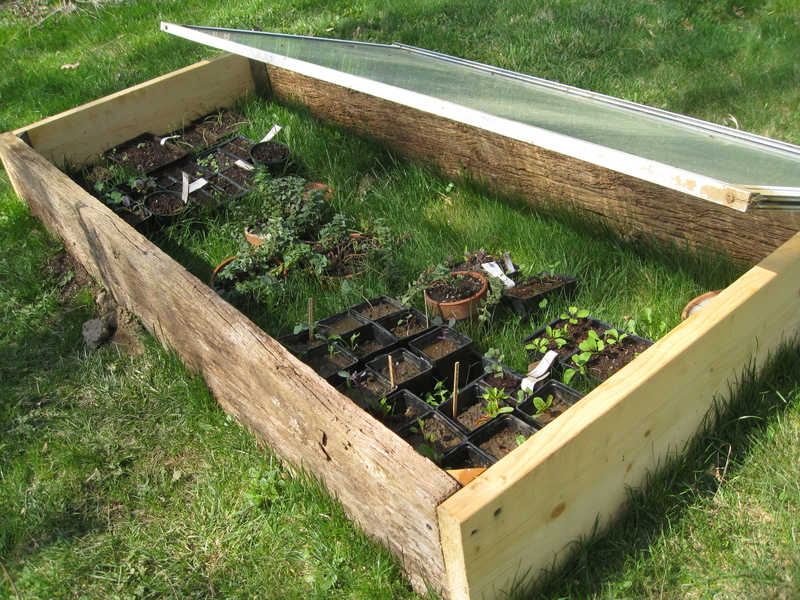 For example, the folks at Lunaria Gardens have a great explanation for how to build the easiest cold frame ever. Savvy Gardener has a nice rundown of the many protective options available for extending the season – some that are even easier than a cold frame (although you probably want to keep a close eye on something like a glass covering over a plant). This video also features a couple of different cold frame designs and there are a few other videos related to it to choose from after watching. For many gardeners, September is the month to put away dreams of fresh vegetables grown with your own hands on the dinner table, but this is more a matter of custom than capacity. The good earth is ready and willing to continue to yield bounty for us, and, with a little additional effort, will do so into the last month of the year. Extending the growing season is a practice that has gone on for thousands of years all over the world. Sixth century texts from China describe gardeners there producing food “in the most unpromising spot and time,” and there are written reports that the Roman elite enjoyed such delicacies as cucumbers in the winter months. We don’t have to be among the elite to enjoy fall and winter vegetables, and it might not even be too late this year to sneak in some simple planting and watering before cold truly descends upon us. Illinois Extension service Educator James Theuri says that, although we’ve had a cool season, the heartier of the cooking greens may still be worth planting. “It started off being cold late into the month of May, when we should have been planting. Now it has started getting cold too early again – September should be warmer than this,” Theuri said. Theuri recommends some of the heartier greens for planting outdoors right now. “Something like mustard greens could go in the ground – those ones are tough,” explained Theuri. “Maybe a few others could be attempted, like kale and collard – the cooking greens.” Theuri also recommends lettuce for those still itching to plant. Across the region, the traditional planting season is winding down, but Theuri said those of us in Chicago have a couple of advantages that extend that season a bit. “Chicago has a micro-climate of its own,” Theuri said. “It’s a concrete jungle out there, and concrete absorbs a lot of heat. There’s also the Lake Michigan off-shore air temperatures that keep the city warmer. For those gardeners who are looking for more than a few weeks of luck to sneak in a mini-crop of greens, though, Theuri recommends one of the more common season extending structures to turn those few weeks before cold settles in into months of growing – well after that first frost date. “If you don’t want to chance whether you’ll be successful or not … the thing to do then is to cheat mother nature,” explained Theuri. “If you can cover those plants with some sort of structure, that will protect them against storms, cold snaps of temperature [and the] wind chill factor … one of the simplest of them all is called the cold frame – it’s just a box with a covering that will allow light through.” That covering can be made of glass, plexiglass, or plastic, Theuri said. The covering, known in fancier circles as the “light,” can be something as simple as a storm door window. Theuri said he spotted just such a window going into the trash one day, salvaged it and now grows lettuce into November and December each year in an 18-inch-high cold frame (on the south side of his office building, he noted, where there is a micro climate that ticks temperatures up a few degrees), where he estimates the temperature is up to about 10 degrees warmer than outside. 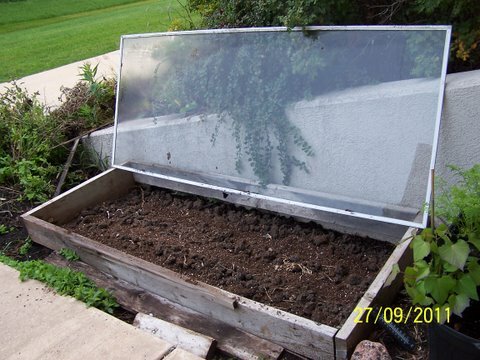 James Theuri grows vegetables well past the fall growing season using this simple cold frame. A slightly more complicated alternative to the cold frame is the tunnel, which is a series of hoops made out of wood, metal or pvc piping and covered with a plastic sheet. “High tunnels” act as mini-greenhouses, with everything you need in a greenhouse but the temperature control – the man-made temperature control, that is. Low tunnels will come to the knee or waist and are a little less convenient as they cannot be stood up in. Your fall crop will even benefit from something as simple as a blanket from the house on a chilly night, Theuri added. “Row covers – you can just put down row covers or blankets or bed sheets over plants if you know it’s a frost night and you can protect them,” he said. If a gardener is willing to keep an eye on the thermometer and employ some of these simple plant-protecting solutions, they are in for a treat, Theuri said. “If you are successful with your crops, the cool season vegetables, some of those crops taste sweeter …They tolerate the cold by accumulating sugar in the leaves … they taste even better,” Theuri said. Thanks to James Theuri for the photographs.